They top Tisbury Tigers in OT thriller. 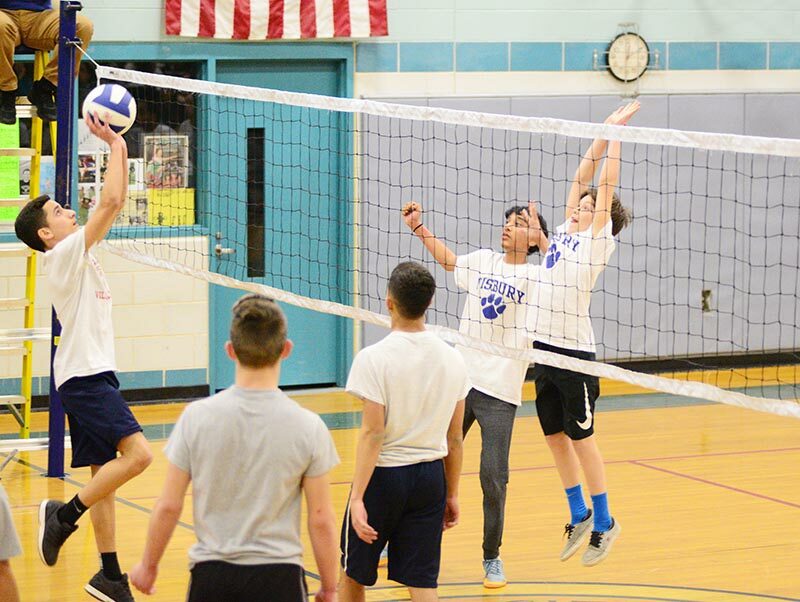 The Edgartown Eagles won a tiebreaking fifth set by a 15-9 score over the Tisbury Tigers to claim the 2017 junior high coed volleyball championship at the Oak Bluffs School gymnasium last Thursday afternoon. Fans and schoolmates braved driving rain to pack the gym, and were rewarded with a nailbiter that saw the Tigers fight back from elimination to force the tiebreaking fifth set. The Eagles’ Jordan Coyle was a force in the overtime match, breaking a tie in the early going with several blocks of Tisbury shots at the net, which put the Eagles up by an 8-4 count. With a three-point bulge at 12-9 in the tiebreaker, the Eagles scored on a Coyle putback, then held service for the win. Hiaggo Goncalves spiked the ball into the open court to earn the final point and clinch the championship. The top-seeded Tigers brought an 8-1 record to the championship game against a 6-2 Eagles squad, but there was little difference in the teams. 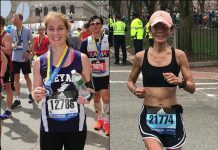 Charlotte Packer (Tigers) and Deborah Silva (Eagles) are both accomplished servers. Jordan Coyle (Eagles) and Mike Trusty (Tigers) are big, strong net players. As the contest unfolded, the strategic play of the most diminutive players, “setters” (players in the middle) Nick Cranston of Tisbury and Kaio Pereira of Edgartown, provided steady and balanced play for their respective sides. Jordan Coyle, Hiaggo Goncalves, Gabe Brito, Amanda Moraes, Kaio Pereira, and Deborah Silva started the match for Edgartown, with skilled server Ethan Creato, Parker Ben David, and Ashley Brasfield in the wings. 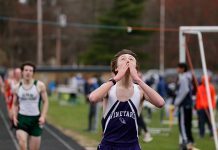 The Tigers fielded Eric Reubens, Jonathan Norton, Mike Trusty, Gabby Vieira, Charlotte Packer, and Nick Cranston, with Alexa Pil, Finn Lewis, and Braedyn Clark backing them up. The pendulum swung wildly in the opening minutes of the match. The Eagles reeled off seven consecutive points in the opening set behind server Deborah Silva before the Tigers got on the board. Trailing 11-3, Gabby Vieira held serve for eight points as the Tigers rallied to tie the score. The lead changed hands three times before being knotted at 20-20. Despite strong play at the net from Mike Trusty and the calm setting skills of Nick Cranston giving Tisbury a 24-22 bulge, Edgartown won four straight points to take a 26-24 verdict. The first set was a study in contrasts. 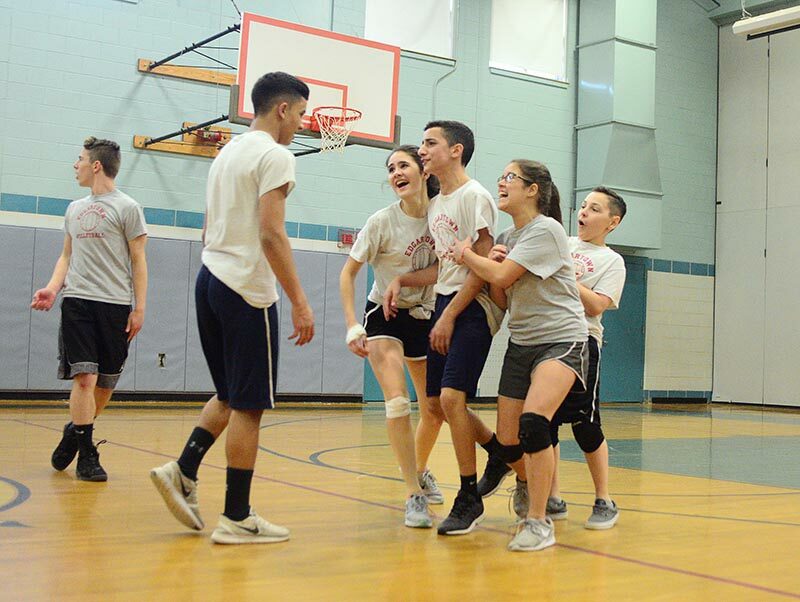 Both teams went on long early runs, then settled into a strategic game in which setters boosted the ball to players at the net, who alternately slammed or gently tipped the ball over the net. 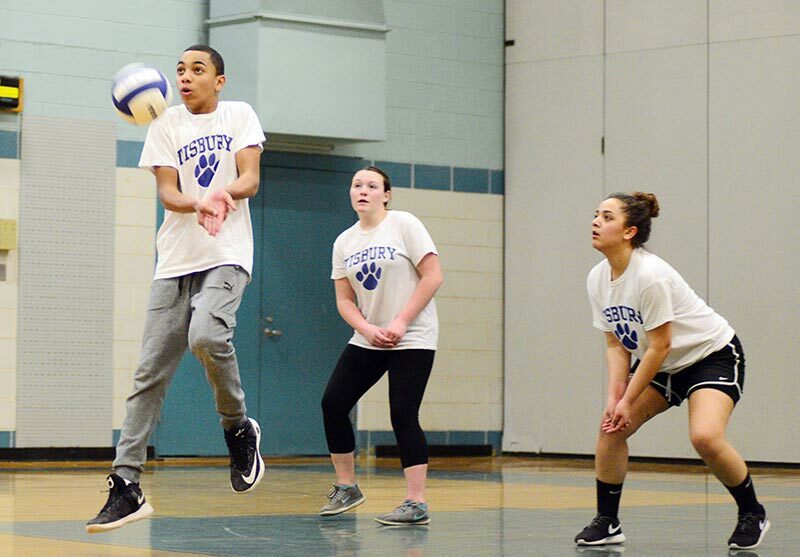 Servers looked for creases, and the “diggers” for both teams earned their nicknames. “Diggers,” generally playing in the middle of their court, are responsible for keeping shots alive, often by sliding and diving. 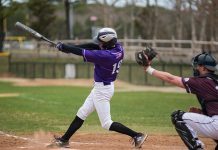 Eric Reuben’s digging play stood out for Tisbury. The Eagles’ Amanda Moraes favored a kamikaze diving style which earned her a trip to the trainer for repairs to a bloody knee before returning to play in her undaunted fashion. The second set was pure grit on both sides, neither holding more than a three-point lead at any point, with extended volleys and a premium on precision play exemplified by Eagle’s setter Kaio Pereira. 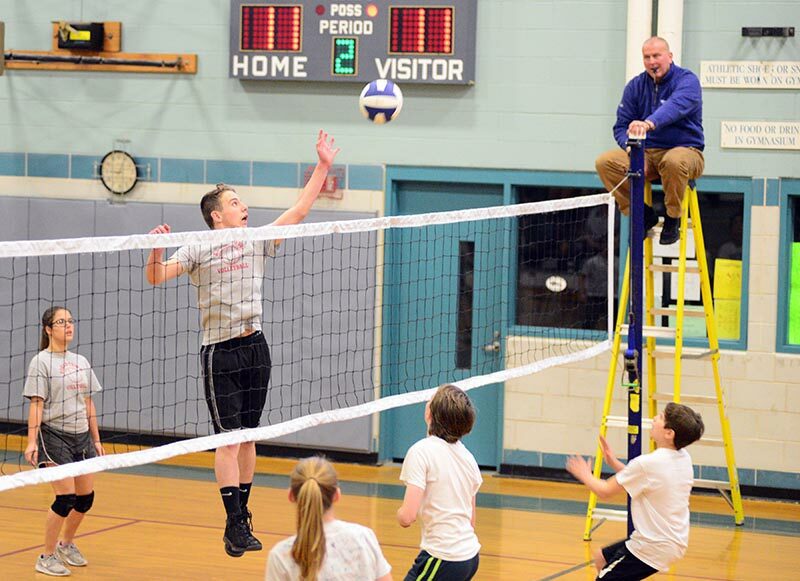 With Tisbury leading 24-23, Mr. Reubens served up an ace for a 25-23 Tiger victory. 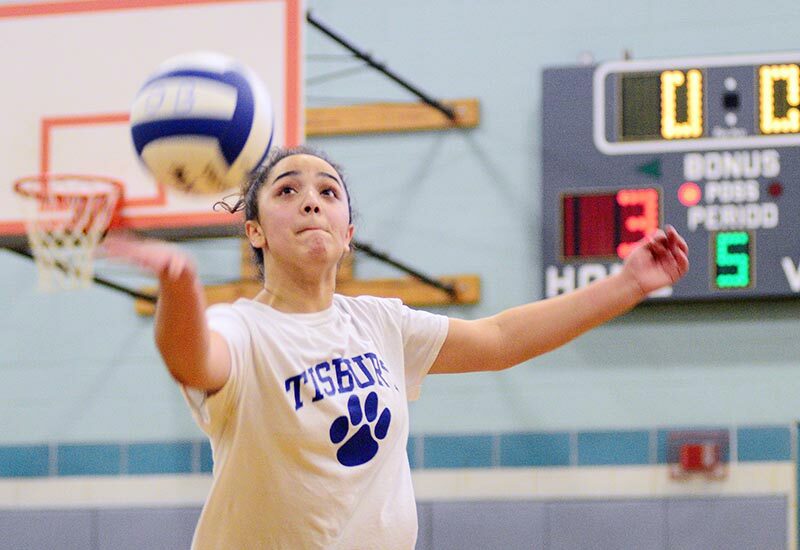 Tisbury went down 10-5 in the third set, largely on out-of-bounds shots, before rallying to come back within four at 20-16. Edgartown hung on for a 25-18 win on a thunderous putback by Jordan Coyle. Down 2-1 in the best-of-five-set championship match, the Tigers won a long, tight fourth set 25-22. Neither team led by more than a few points until Gabby Vieira’s return bomb gave the Tigers a 25-22 win. Tiebreaker sets in volleyball require the winner to score 15 points first, rather than the 25 points required to win regular sets. Edgartown won the volley for serve, and sprinted out to a 7-3 lead after a tight opening five minutes. The gym grew quiet as the Eagles extended the lead to 12-7. 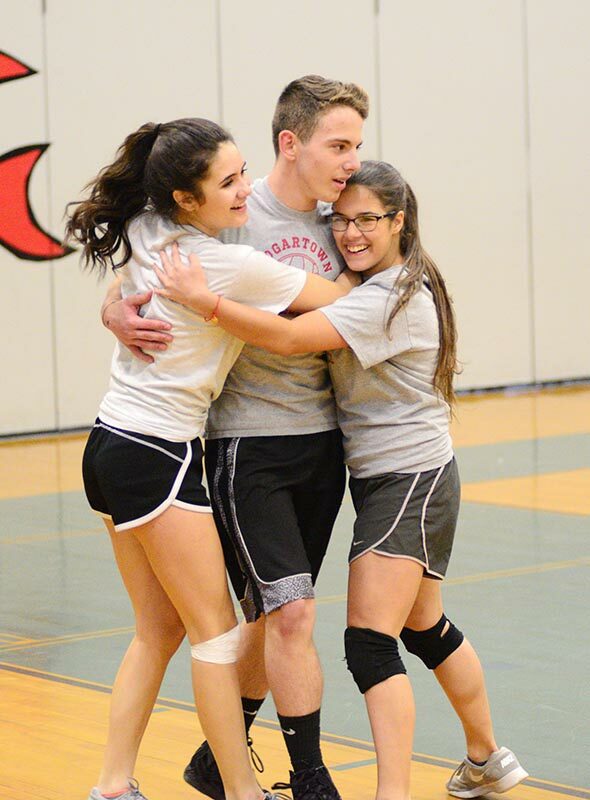 Partisan support grew in volume as Gabby Vieira’s play brought the Tigers back to within 12-9, before Jordan Coyle and Hiaggo Goncalves put the title away for the Eagles.